Wet materials are continuously fed into the first layer drying plate on the top of the dryer. They will be turned and stirred by the rakes whose arms make rotational motion. The materials flow through the surface of the drying plate along the index spiral line. On the small plate the materials will move to the outer edge and drop down to the large drying plate. On the big one they will move inward and drop to the small plate on the next layer from the central hole. Both small and large drying plates are arranged alternately so that the materials can get through the whole Continuous Plate Dryer. The heating media will be led into the hollow drying plate. The heating media includes saturated steam, hot water and conduction oil, and it will enter from one end and derive from the other end. The dried materials will drop from the last layer of the drying plate to the bottom layer of the shell. Finally, they will be transferred to the discharge port by the rakes. The moisture escapes from materials and will be expelled from the wet discharge port on the top cover. The moisture of vacuum type drying machine will be drawn out by the vacuum pump. 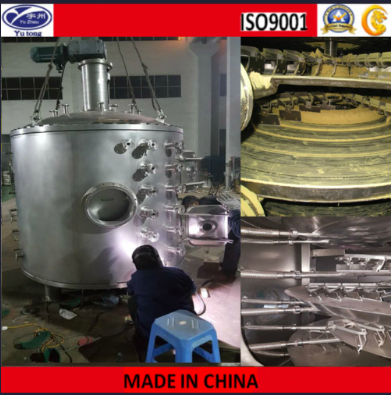 Drying pasty and heat sensitive materials, this continuous plate dryer can recover the solvent and conduct pyrolysis and reaction operation. For more information, please refer to PLG continuous plate dryer. Looking for ideal Plate Dryer Manufacturer & supplier ? We have a wide selection at great prices to help you get creative. All the Plate Dryer Machine are quality guaranteed. We are China Origin Factory of Disk Drying Machine. If you have any question, please feel free to contact us.